YOP is your mobile market to sell and buy new and used stuff locally and near you. Take a snap, post and sell your product easily, or browse, chat and buy instantly! Invite your friends, build your network and discover a new way of selling and buying. 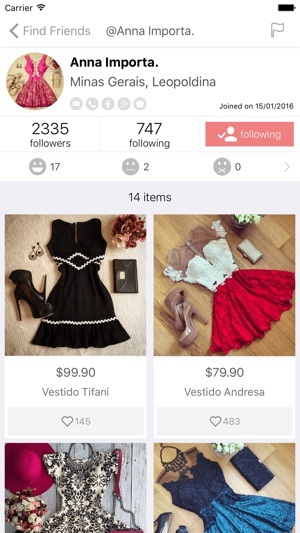 Build your own network of friends in YOP and buy and sell safely! Stumble upon and be surprised daily with thousands of new products thoroughly curated for you! You can buy that thing you’re looking for! Discover incredible deals from local sellers in our section “Offers near you”! THERE'S EVEN MORE? OH YEAH! FILTER your searches by LOCATION, price, condition and popularity and buy that thing you are looking for. Share your ad for free on your social networks to reach more buyers and sell faster! There must be something you don’t use and need to sell! 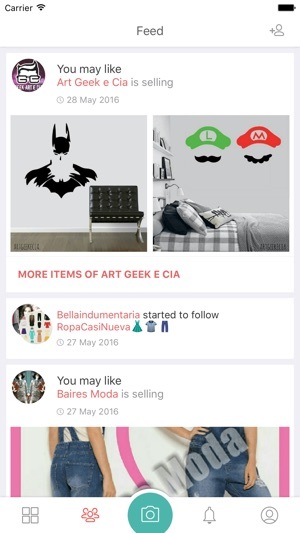 • Chat with sellers through the private CHAT. • LIKE your favorite items. • FOLLOW the best users. • RATE the sellers (and buyers) and leave them feedback. You just have to snap a picture, add a description and post it! SHARE and SELL your ad FOR FREE on your social networks and increase your chances of selling. Post that thing you don't use anymore or post brand new products. 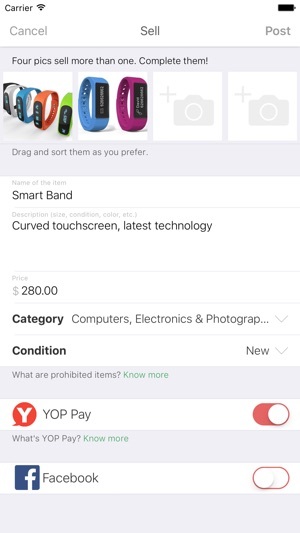 Selling in YOP is easy, fast and safe! Buy new or secondhand products in your area, chatting and bargaining directly with the seller from inside the app. Build your own NETWORK OF FRIENDS at YOP and buy safely! Make an offer to the seller and have fun shopping. There are lots of products near you! 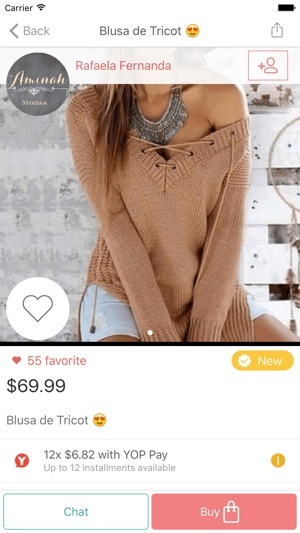 Buy and sell all your clothes and accessories inside our app: cassual dresses, blouses, leggings, floral dresses, one-pieces, shirts, shorts, hats, bikinis, wedding dresses and much more. Renewing your entire closet has never been easier! For Her: women’s paradise. From sandals to high heels, find and shop the shoes that you love! Most amazing deals and shoes on sale! Sell everything that you won’t be using and start making money! For Him: Buy dressing shoes, mocassins, kicks, flip-flops, soccer cleats and more. Shop the best brands! Make money, let go that thing you don’t use anymore! If you’re a sports fan, then YOP is the place to be and where you’ll find anything you need to buy in order to stay in shape! From football and tennis supplies to basketball shirts and bike accessories. Post anything you don’t use anymore and start selling, there’s no looking back! Compare between thousands of different smartphones. Big, small, new and used. Every model and their accessories are available. Selling your old smartphones and buying a new one has never been easier! Amazing deals! What are you waiting for? Start making money selling what you don’t use anymore! Health & beauty products. Make-up products, hair products and all sorts of stuff and beauty hacks. Be ready for any occasion! Is there a baby or newborn in your family? Buy: toys, baby clothes & shoes, baby strollers and tons of other products. Did your baby grow up and is a toddler now? Don’t pass on the incredible opportunity of selling what it won’t be using anymore. Post an item and start selling now! Computers, notebooks, smart tablets and all their accessories and parts in a single place! Buy and sell locally, now! Headphones, DJ equipment, point & shoot cameras, dslr cameras, security cameras, drones, e-readers. If you need something, you can buy it here! Guitars, basses, piano keyboards, microphones & more. New and secondhand, satisfy your music needs with what we offer at YOP. And lots of other stuff too! Thanks for your suggestions! We're continually working to improve your experience while using YOP, taking into consideration all feedback that you give us. Very cool app! Simple and easy to use and it simply looks awesome. 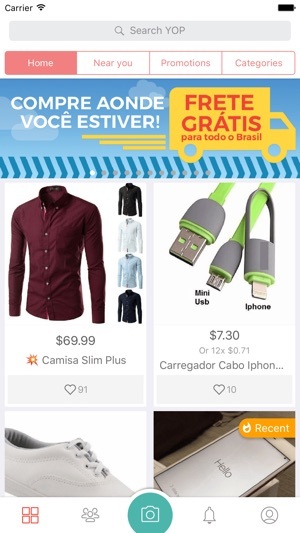 Also, it has a bargaining feature that I haven´t seen in other apps before. Download ! You won't regret it! Why is everything in Spanish?? Awesome if I spoke Spanish but I can't even fix the language setting either because I can't find it or maybe the app is just in Spanish. If I'm missing a step tell me because I am confused.